The Journey: Special FREE Community Presentation! As Toronto’s Regent Park neighbourhood undergoes the most ambitious urban transformation in North America, art will dramatically imitate life on The Journey stage. 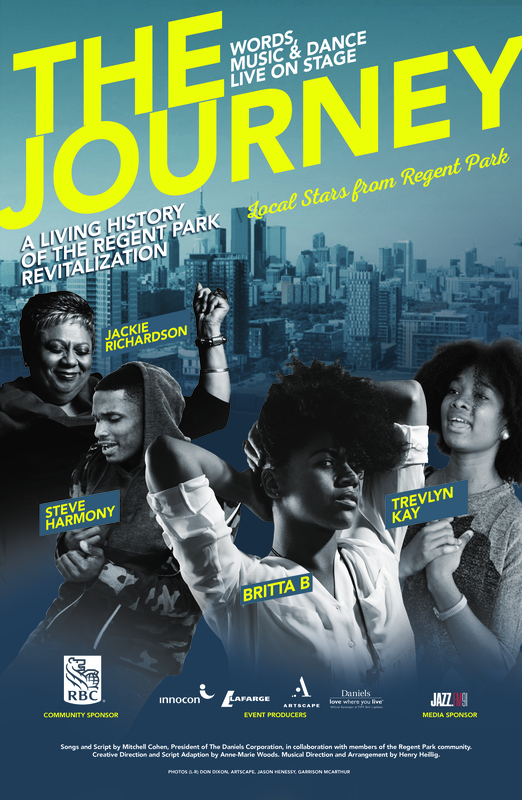 Using a powerful combination of words, music and dance, The Journey documents Regent Park’s nearly 70-year history through the eyes of local residents. Not only is the show inspired by the real-life stories of Regent Park residents, it is being performed by artists and young people from the local community. 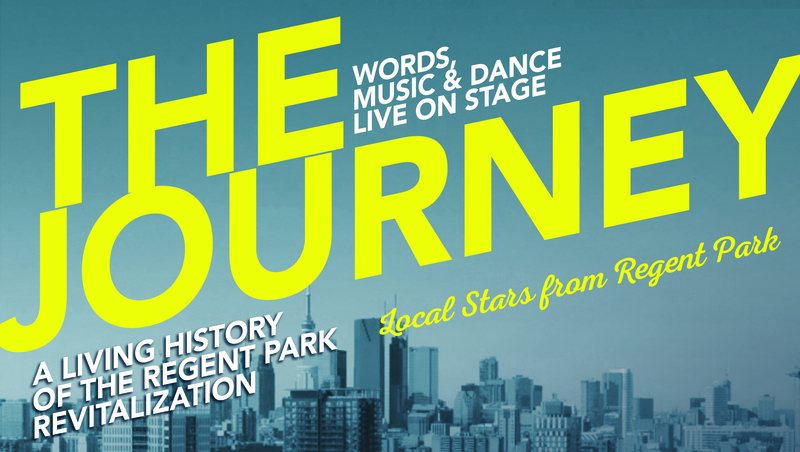 The Journey is written by Mitchell Cohen, President of The Daniels Corporation, in collaboration with members of the Regent Park community, with adaptation by Creative Director Anne-Marie Woods and musical direction by Henry Heillig. The Journey will tug at your heartstrings and leave you wanting more. 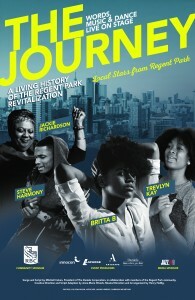 FREE tickets for the performance on Friday, June 19th are available for people who live and/or work in Regent Park. The free tickets are available for pick-up at these ticket centres while quantities last. * Tickets are only available in advance from these ticket centres. Tickets will not be available at the door. The Journey is suitable for ages 13 and up. The Journey showcases award-winning Regent Park spoken word artists Trevlyn Kay (5 Fingers 1 Fist) and Britta B (2013 Toronto International Poetry Slam Champion); R&B singer-songwriter Steve Harmony; emerging stars Itzel Julieta Velázquez Martínez, Simba Wetu, and Limees Riezig; Regent Park School of Music graduates Charlotte Siegel and Stacy Darko and acclaimed pianist Thompson Egbo-Egbo. Joining these local talents on stage is the electrifying, award-winning, world-class performer Jackie Richardson (‘The Nina Project’, ‘Adventures of a Black Girl in Search of God’), the amazing vocalist, actor and musician Jeremiah Sparks (Mufasa in ‘The Lion King’, and star of the world-renowned show ‘Drum’), and iconic songstress and stage performer Alana Bridgewater (Killer Queen in ‘We Will Rock You’, and Motormouth in ‘Hairspray’). Electronics inclluding a 32” flat-screen TV, Android tablets, Beats by Dr. Dre™ headphones and more! There’s more to our special community presentation than just the show! Come to Daniels Spectrum early for a pre-show reception with snacks, refreshments and live music, and stay after the show for a FREE BUFFET for ticket holders provided by the Regent Park Catering Collective. Plus — there is FREE CHILDCARE available from 6 PM to 10 PM. Observing Ramadan? The show will end in time for the Maghrib Prayer and Iftar Feast with prayer room available.